AAP - 6km north of Siem Reap Town. 8km south of Siem Reap Town. C.E. - Current Era. Roughly equivalent to A.D.
- The 'position' of the ruins listed on the individual temple description pages is the position of the central tower or prasat unless otherwise indicated. Anastylosis Archaeological technique used in reconstructing the temples ruins by dismantling and then rebuilding. This technique was used on Banteay Samre, Prasat Kravan, Thommanon and many other temples. Angkor Angkor refers to the capital city of the Khmer Empire that existed in the area of Cambodia between the 9th and 12th centuries CE, as well as to the empire itself. Apsara Mythological a celestial nymph. Devatas (standing female divinities), though technically different, are also referred to as apsaras in this guide. Carved in abundance on many of the temples. Banteay (Khmer) 'fortress' or 'citadel'. Though not a technical designation, it often indicates a monastic complex or flat temple style. Baray (Khmer) A ‘baray’ is a water reservoir - an area of land where dikes have been raised to catch and hold water. Beginning in the 9th century, the construction of massive barays and other such grand projects became one of the marks of Angkorian kingship. There are four major barays in the Park area. When the barays were constructed, an island temple was set at the center of each. The first major baray to be constructed was Indratataka by King Yasovarman I, measuring 3.8km x 880m and completed in 889AD when the capital was still at Hariharalaya near Roluos. The Roluos Group temple Lolei sat on an island in the middle of Indratataka. Construction of the second major baray, the East Baray (Yashodharatataka,) began almost immediately after the first. At 7.8km x 880m it was almost five times larger than the Indratataka. Almost 50 years later, the temple East Mebon was constructed on an island in the center. The third and largest baray (8km x 2.2km) is the West Baray built in the early 11th century. Unlike the other barays, the West Baray is still partially filled, creating good sized lake. The temple ruins of West Mebon sit on an artificial island at the center of the baray (requiring a short boat ride to visit.) The last baray (Jayatataka) was constructed by Jayavarman VII in the late 12th century. It is considered to be the baray of Preah Khan though it is Neak Pean that actually sits at the center. The function of barays is a matter of academic debate. A recent study has argued that the barays did not serve an agricultural purpose but were built and maintained solely for political/religious reasons. Conventional wisdom has it that the barays were part of a giant water works used to irrigate the rice paddies and provide water for year round cultivation, though they certainly served a political and religious function as well. Boeung (Khmer) 'lake'. Also spelled ‘beng’. 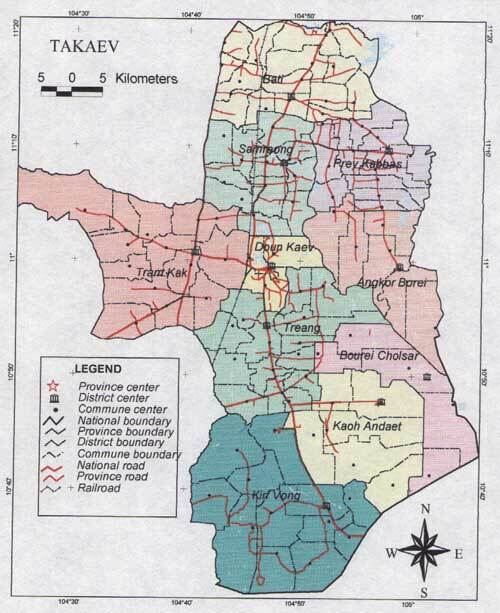 Champa Neighboring Indianised state, contemporary with Angkor. Located in the area of south central Vietnam. Corbel arch False arch made from placing tiered, progressively projecting corbels on opposite walls. Used throughout Angkorian era construction. Gopura The entrance-way or gate in the wall that surrounds a temple. 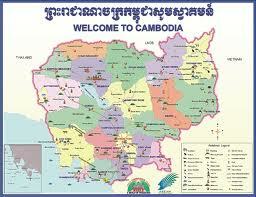 Khmer The dominant ethnic group and the language of ancient and modern Cambodia. Linga A phallic symbol, representative of the god Shiva. Lintel The sandstone block above doorways and windows, often intricately carved. Monastic complex General term referring to a temple that has a relatively flat, sometimes sprawling architectural layout. It may employ towers, but set at ground level, e.g. : Ta Prohm, Preah Khan, Banteay Kdei. Naga Mythological, multi-headed snake/serpent. Naga motifs are often used in balustrades. Phnom (Khmer) 'hill' or 'mountain'. Reamker Khmer telling of the Ramayana, a classic and much loved epic tale from Hindu mythology - the adventures of Rama in his quest to save his kidnapped wife, Sita, from Ravana. Images from the Ramayana are carved on many temples including Angkor Wat, and traditional dance performances in Siem Reap often incorporate stories from the Ramayana. Shiva One of the three primary gods of the Hindu trinity. The ‘destroyer’. 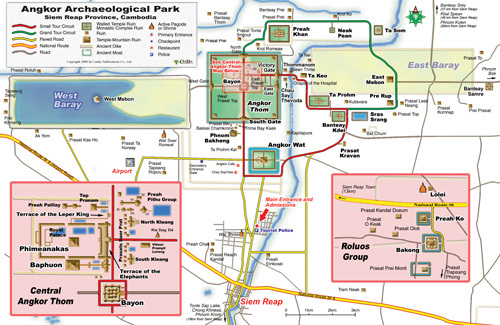 Central to the Angkor royal linga cult. Often represented in the form of a linga. Temple-mountain A specific architectural design based on the mythological mountain, Mt. Meru. Eg: Pre Rup, Ta Keo, Bakong. -varman (Khmer) ‘protected by’. The suffix attached to the names of Khmer kings, e.g. : Suryavarman, Jayavarman. Vihear (Khmer) Main temple building of a Buddhist pagoda or temple group. Houses the Buddha image. Vishnu One of the three primary gods of the Hindu trinity. The ‘protector’. Wat Modern Buddhist pagoda or temple.